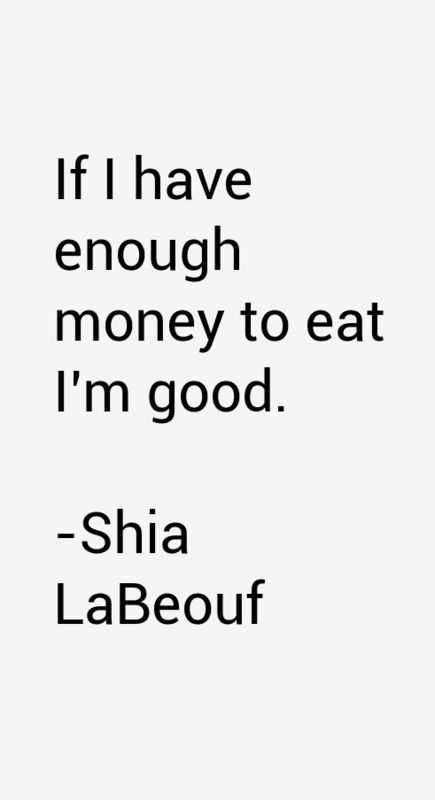 125 most famous Shia LaBeouf quotes and sayings. These are the first 10 quotes we have for him. He's a 32 year old American actor born on Jun 11, 1986. I thought Shia LaBeouf was the brightest new star I'd seen since Micheal J. Fox. I couldn't wait to see his next film. But lately I've lost all respect I had for him, because like so many other people in Hollywood, he jumped on the left winged,liberal idiot, train and started making a fool out himself and just like the other liberals in Hollywood, he didn't know how to keep his mouth shut. That statement he made about talent, doesn't even make sense. Talent is something you are born with and it's nothing like luck. You either you have it or you don't. Ask any athlete you want. No matter how hard you work or how much you are trained, if you don't have God Given talent, you won't make it in sports or acting. LaBeouf was given talent and it showed in him the minute he got in front of a camera. Some people get by on looks, but you can tell real quick if they have talent or not. Sad that LaBeouf had to ruin himself by falling in with the liberal, looney tunes! From now on, all I'll see, when I see him, is a big disappointment. Now I'll just have for the next gifted actor to come along, because I've watched the film I'll ever watch with Shia LaBeouf in it.